Jerome Reynolds shares his story with the crowd. 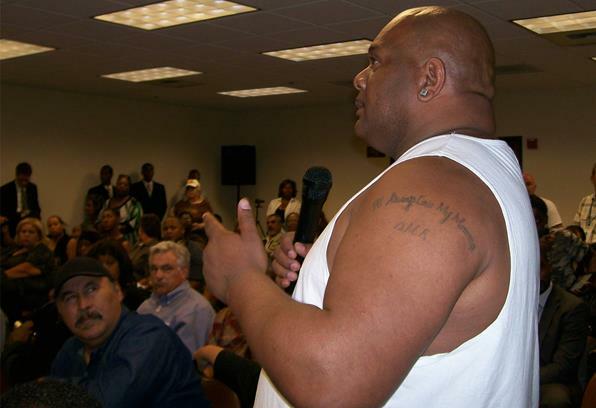 PALMDALE – Nearly 20 residents grabbed the microphone at the Section 8 Community Forum Thursday night to give first-hand accounts of what they called abuse and harassment by Palmdale and Lancaster deputies. “As we came into this area with our vouchers, we have been harassed,” said Toni Clark. Toni Clark says officers put her in a choke hold. Clark said during a traffic stop for a broken taillight three years ago, deputies searched her purse and found a very small amount of marijuana. She said they immediately put her in the squad car and contacted compliance officers to ask if Clark was on Section 8. She said her voucher was revoked shortly after, and since the incident, she’s been continually harassed by law enforcement. She said one time they even put her in a choke hold. Jerome Reynolds said deputies stormed his wife’s home on a bogus tip. 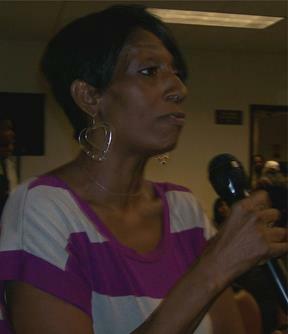 Some audience members wept as LaTiss Pugh told of how her infraction turned into 107 days of incarceration. She said it happened when an officer followed her home and into her driveway and then attempted to conduct a search before issuing the infraction. Public Counsel Attorney Catherine Lhamon recorded the names of all the residents who gave comments at Thursday’s forum and even recorded the names of those who were afraid to speak but still felt that they were mistreated. She said she would be contacting them all next week to get a permanent record of their stories and to determine if their stories could help the lawsuit. She is also turning over all the names to the Justice Department to assist with its pattern of practice investigation. 3 comments for "Section 8 recipients in the AV speak out"
This disgusts me. I worked for DPSS in the Antelope Valley and the rate of abuse is astronomical. To read someone say “they searched my purse and found a very small amount of marijuana” and then expect them to do her some sort of favor? How about not using the hard earned tax dollars of the working class (like the one who pulled you over) to buy even a “very small amount of marijuana.” Especially when our government will blindly cut the budget and eliminate jobs of law enforcement BEFORE they will consider making welfare and section 8 uncomfortable so that people will have an incentive to pull themselves together, stop crying victim and go EARN their way in this world. When you are living on your OWN dime then by all means…go indulge in a “very small amount of marijuana.” Until then I hope the system continues to make welfare and section 8 unappealing for people who can work, go back to school, or do something besides leach off the hard work of others. Lets start saving “public assistance” for the elderly and disabled and others who truly need it.